Adhering to the objectives of non-destructive materials characterization, a contact-less --air-coupled -- method of ultrasound is highly desirable. However, exorbitant acoustic impedance mis-match between the coupling air and the test media presents a natural impediment to NCU. This impedance mis-match can be as high as seven orders of magnitude for some materials. Therefore, high frequency Non-Contact Ultrasound (NCU) propagation in materials has been regarded as an impossibility. On the other hand, low frequency ultrasound -- 25kHz to 100kHz -- can be propagated through materials in non-contact mode. However, these frequencies are practically useless for the interrogation of most materials where the industry demands high resolution and high detectability. Recent advances in high transduction high frequency piezoelectric transducers (200kHz to 5MHz) and an exceptionally high dynamic range nanosecond accuracy ultrasonic system have advanced the NCU practice to levels that rival conventional contact method. In this paper we provide an introduction to NCU and present examples of green and sintered ceramics and composites analysis. Applications of NCU are considered to be truly significant for cost-effective manufacturing of high reliability materials. 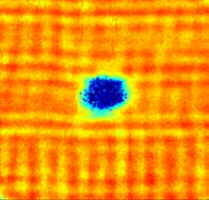 It is now well-established that if ultrasound can be propagated in a given medium than significant information about that medium can be deciphered, Table I.  the inversity of composition and microstructure of ceramics, powder metals, and composites, materials suitable acoustics and techniques have been developed during the last 10 years for accurate non-destructive characterization of these materials. Ultrasound method is nondestructive in nature, but the mechanism of ultrasound propagation in the test materials involves the use of liquids such as, water, oil, gels, etc. Specifically, these liquids are used between the transducer and the test material for efficient ultrasound propagation. From a practical standpoint, liquid contact with some materials is either not desirable, or would destroy green, porous, liquid-sensitive, and continuously formed materials. In order to circumvent this problem, it is imperative to eliminate transducer, or any other type of contact with the test materials. Achievement of NCU first requires the generation of very high transduction transducers to overcome the exorbitant acoustic impedance barrier between air and most materials. Time Domain Times-of-flight and velocities of longitudinal, shear, and surface waves. Density, thickness, defect detection, elastic and mechanical properties, interface analysis, anisotropy, proximity & dimensional analysis, robotics, remote sensing, etc. Attenuation Domain Fluctuations in reflected and transmitted signals at a given frequency and beam size Defect characterization, surface and internal microstructure, interface analysis, etc. Frequency Domain Frequency-dependence of ultrasound attenuation, or ultrasonic spectroscopy Microstructure, grain size, grain boundary relationships, porosity, surface characterization, phase analysis, etc. Table I: Ultrasonic Measurements and their Applications. Fig 2: 3.0MHz non-contact transducers separated by 10mm ambient air. Bandwidth: 2.0MHz (75%) Sensitivity: -64dB. SNR: 30dB. However, in order to obtain non-contact ultrasound performance analogous to conventional liquid-coupled ultrasound more than high transduction transducers are needed. For example, if we have an ultrasonic excitation and amplification system that would provide 100dB extra gain (30dB to compensate for contact-non-contact mismatch and 70dB to over come air-material acoustic impedance mismatch), only then we can have a non-contact ultrasound performance similar to that of the conventional contact mode. In 1997 the non-contact transducer development was complemented by the creation of a dedicated ultrasonic non-contact analyzer, the NCA 1000 (U.S. patent pending), Fig. 3. This system is based upon the synthesis of a computer generated chirp with transducer characteristics and advanced signal processing. Ultimately, the NCA 1000 provides >150dB dynamic range, a nano-second accuracy, and high speeds for data acquisition. As will be seen in the subsequent sections, these features are significant for the execution of NCU analogous to the conventional contact or immersion mode of testing. After routine calibration for air velocity and times of flight in air column and from material surfaces, the NCA 1000 determines the test material thickness and velocity simultaneously, Fig. 4. For non-dispersive and low acoustic impedance materials, this system also determines their densities by measuring the true attenuation in materials. In order to evaluate the surface and internal microstructure of materials, the NCA 1000 provides a mechanism for ultrasonic spectroscopy, Fig. 5. Test materials can also be imaged in non-contact mode by integrating this system with appropriate transducer scanning system. Parameters measured and functions performed by NCA 1000 are shown in Table II, relative to their significance in materials characterization. Fig 3: Non-Contact Analyzer NCA 1000 shown with transducers and test material (left) Fig 4: NCA 1000 screen displaying the velocity and thickness of a test material Fig 5: NCA 1000 screen ultrasonic spectroscopy mode. In most cases it is desirable to operate the NCA 1000 in direct transmission mode, Fig. 6 and 7. In this mode a material can be characterized for thickness, velocity, density, defects, and microstructure. When the material surface needs to be evaluated, this system can be operated in direct reflection mode, Fig. 9 and 10. In this case reflectivity of ultrasound is directly related to the surface roughness or its microstructure. When a test material is accessible only from one side, the NCA 1000 can also be operated in T-R (Transmitter-Receiver) reflection mode, Fig. 11 and 12. It should be stated that operation in this mode is arduous since the optimization of reflected signal from the test material thickness is a sensitive function of the incident angles of two transducers, which (angles) tend to be very small in magnitude. Times of flight: Displayed on the screen. Determination of thickness and velocity simultaneously and automatically. Time of flight in conjunction with integrated response: Displayed on the screen. Determination of thickness, velocity, density, and attenuation simultaneously and automatically. Phase detection: Performed by simple steps. Detection of subtle compositional and structural variations. Fig 6: Direct transmission mode Fig 7: Signal through 18mm green SiC @ 1MHz, per Fig. 6. 1 st peak: Direct transmission in material. 2 nd& 3 rd peaks: Thickness reflections. In this section we provide several examples of the feasibility of NCU method for ceramics and composite characterization. Fig 8: Direct reflection mode Fig 9: Signal from 35mm SiC surface @ 2MHz,Per Fig. 8. Transducer to material distance in Ambient air: 10mm. Fig 10: Transmitter-Receiver in reflection mode Fig 11: Signal through 32mm polystyrene @ 1MHz, per Fig. 10. 1 st peak: Reflection from material thickness. Other peaks: surface waves. Several samples of green and sintered Al2O3 of known density were characterized for ultrasonic velocity in order to establish reference relationship, for comparison with unknown density samples. Figures 12 and 13 respectively, show these relationships for green and sintered Al2O3. These observations were generated in direct transmission mode (Fig. 6) by utilizing 1MHz 12.5mm active area diameter non-contact transducers. Transducer to material surface distance in ambient air is 20mm each for the transmitter and the receiver. For very high velocity sintered Al2O3 2MHz transducers were used. Fig. 14 shows the comparison of physically and ultrasonically determined densities of green Al2O3. Fig. 15 shows velocity density relationship for copper powder compacts (furnished by Ames Laboratory), varying in density. This method of materials characterization has been successfully applied to green materials from <1mm to >200mm; porous materials from <3mm to > 200mm; and dense materials from <5mm to >50mm. Based upon the repeatability of data at a given point of observation the accuracy of velocity, and thus the density, for green ceramics is better than +/-0.5%, for porous materials, it is ~+/-1%; and for dense sintered materials, it is ~+/-5%. At first these observations appear to defy the known norms of ultrasound. However, when we consider the fact that in non-contact mode it is much easier for ultrasound to propagate through low acoustic impedance materials (green, porous, fibrous, polymeric, etc. ), then the observations relative to accuracy and repeatability make perfect sense. This conclusion is based upon the fact that the transmission efficiency is higher when ultrasound travels from the coupling medium air to test materials with relatively low acoustic impedances. Therefore, from the standpoint of the applicability, non-contact ultrasound may not be highly effective for materials that are characterized by 20 MRAYL or higher acoustic impedance and velocities greater than 7000m/s. Such materials are single or multi-phase super-dense impervious sintered oxides, carbides, nitrides, borides, and diamonds; and ferrous metals and alloys. However, if it is absolutely necessary to apply non-contact ultrasound for the characterization of these materials, it can be accomplished by modifying the environment of testing and the material. Details of this subject are beyond the scope of this paper. Here we have shown the mechanism of density measurement by first establishing a reference velocity relationship with known density materials. This is analogous to conventional liquid or dry coupled modes of ultrasound. However, NCA 1000 has been further advanced to make absolute density measurements, but their accuracy at the present time is limited to non-dispersive and relatively low acoustic impedance materials. Automatic velocity and density measurements cannot be reliably made for those materials whose thicknesses are within the proximity of the ultrasonic wavelengths and those that are extremely dispersive such as, extremely coarse-grained refractories, abrasive wheels, cellular ceramics, etc. In order to meaningfully analyze such materials it is possible to relate their relative ultrasound attenuation as a function of material density or microstructure. Relative attenuation, measured by subtracting the integrated response (Table II, area underneath a given peak) of transmitted signal through the material from that of the air column, has been found to be directly related to material velocity and density figures 16 and 17. Such cross-relationships can be extremely beneficial in not only estimating the densities of difficult-to-measure materials, but also in the detection of overt defects and micro-cracks. For example, in some pressed ceramics while the velocity-density relationship was found to be linear, but the same was not true when density/velocity was related to relative attenuation. Sudden increase in attenuation for samples pressed at extremely low and high pressures can be indicative of defects such as delaminations. In order to determine the feasibility and detectability of defects in non-contact ultrasonic mode, 1.5mm diameter side drilled cylindrical holes were made in green and sintered ceramics. The green ceramic is a 14mm thick porcelain and the sintered material is a 20mm porous (80% dense) NZP ceramic. Fig. 18 shows typical transmitted ultrasonic signal as a function of defect-free and defective regions in the green ceramic. Fig. 19 shows similar observations from the sintered ceramic. Figures 20 and 21 show defect detection in pressed green powder metal materials. From these observations it is apparent that when ultrasound encounters a discontinuity in its path of propagation, then the amount of energy transmitted is reduced, relative to that from a defect-free region. When ultrasound is reflected from the surface of a material, Fig. 8, its strength can be indicative of surface density, inter-granular relationships, roughness, etc. The reflectivity of ultrasound at a given frequency varies as a function of scattering. Relatively speaking, the higher the scatter (coarse-grained surfaces), the lower will be the reflectivity. NCA 1000 measures this signal strength in terms of integrated response of the reflected peak, Table II. In order to exhibit the sensitivity of non-contact ultrasound for surface characterization several SiC abrasive disks, varying in particle size, were used as surface reflectors. By using a 2MHz and 12.5mm active area diameter non-contact transducer placed 10mm away from the reflecting surface, the integrated response from SiC disk surfaces was measured. A similar measurement from the polished surface of carbon steel was assumed as a reference. Fig. 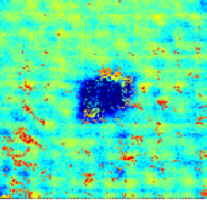 22 shows reflectivity of ultrasound from SiC surfaces as a function of polished steel surface reference. When the NCA 1000 is interfaced with a suitable motorized x-y scanning hardware, it can also be used to generate ultrasonic images in the familiar format of conventional C-scan mode. In order to illustrate this 1MHz non-contact transducers with an aperture of 2mm were raster scanned in transmission mode over a mildly impact-damaged 6.3mm thick sample of glass fiber reinforced plastic composite in order to generate its image. This data was produced by monitoring the integrated responses from the directly transmitted (1st peak) and the reflected (1 st thickness reflection of the material) signals from this material. Figures 23 and 24, respectively show transmission and reflection images of this material. Fig 26: Color scale representation of Velocity (m/s). Recently we have also applied the C-scan imaging technique for attenuation and velocity imaging of green materials. Figures 25 and 26 show attenuation (integrated response) and velocity image mapping for a green pressed iron-based material. The sample is 60mm diameter and 14mm thick. Non-contact ultrasonic transducers used are nominally 600kHz and 12.5mm active area diameter. In order to increase lateral resolution, an aperture of 1mm diameter was placed between the transducer and the specimen. One of the significant functions of the NCA 1000 is that one can monitor the trend of any measured parameter (thickness, velocity, time-of-flight, Integrated Response, attenuation, and density) as a function of its variation from one point to another. The system provides two trend plots, thus facilitating two independent measurements of a material, or from two different locations on it. The speed of a trend plot can be synchronized with that of the moving object or the material. This feature is beneficial for linear imaging or for on-line applications where the product is in motion. Non-contact ultrasound is a new method, which has been the dream of materials and ultrasound scientists and engineers. In this paper we have provided an introduction to high frequency non-contact ultrasound. The analytical functions of NCA 1000 provide thickness, velocity, time of flight, attenuation, integrated response, and phase analysis of any medium through which ultrasound can be propagated. that sense our presentation rivals not only conventional liquid-coupled ultrasound, but also other wave based characterizing methods. Non-contact ultrasound presents an affirmative alternative to hazardous and expensive X-ray, NMR, and Laser methods for materials characterization. In this paper we have also given several examples of green and sintered ceramics and powder metal characterization for velocity, density, surface texture, and imaging. For these applications our transducers and systems have been fully integrated in off-line and on-line applications in manufacturing and laboratory environments. We also believe that in the hands of materials manufacturing and developing experts this development will find numerous uses of value to our increasingly complex world. SecondWave is a new company devoted to the cause of materials processing, quality, and reliability by utilizing novel NON-CONTACT ULTRASOUND. We provide analytical systems, transducers, accessories, technical services, and dissemination of know-how in non-destructive evaluation, non-invasive, and sensing applications in materials and bio-medical industries. Ultrasonic transducers and the NCA 1000 system are now fully developed products and commercially available. SecondWave is owned by Ultran Laboratories, Inc. and VN Instruments, Ltd. Ultran specializes in transducers, materials know how, and characterization; VNI in instrumentation, systems, and signal processing. SecondWave is the recipient of more 50 years of combined unparalleled experience of Ultran and VNI. We convert transducers and systems into applications-oriented solutions for our customers. This approach allows Ultran and VNI to concentrate on R&D and manufacturing. We encourage you to contact us with your specific questions. A. Vary, editor in "Materials Analysis by Ultrasonics," Noyes Data Corporation, New Jersey (1987). A. Vary and J. Snyder, editors in "Nondestructive Testing of High-Performance Ceramics," Proceedings of a conference, Am.Cer.Soc., Westerville, OH (1987). C.H. Schilling and J.N. Gray, "Nondestructive Evaluation of Ceramics," Proceedings Am.Cer.Soc., V 89 (1998). Bhardwaj, M.C., "High-Resolution Ultrasonic Nondestructive Characterization," Cer. Bull., v. 69, n. 9, (1990). Bhardwaj, M.C. and Bhalla, A., "Ultrasonic Characterization of Ceramic Superconductors," J.Mat. Sci. Lett., v. 10 (1991). Kulkarni, N., Moudgil, B. and Bhardwaj, M., "Ultrasonic Characterization of Green and Sintered Ceramics: I, Time Domain," Am. Cer. Soc., Cer. Bull, Vol. 73, No. 6, (1994). Kulkarni, N., Moudgil, B. and Bhardwaj,M., "Ultrasonic Characterization of Green and Sintered Ceramics: II, Frequency Domain," Am. Cer. Soc., Cer. Bull, Vol. 73, No. 7, (1994). Schindel, D.W., Hutchins, D.A., Zou, L., and Sayer, M., "The Design and Characterization of Micromachined Air-Coupled Capacitance Transducers," IEEE Trans. Ultrason. Ferroelect. Freq. Control, v 42 (1995). Bhardwaj, M.C., "Innovation in Non-Contact Ultrasonic Analysis: Applications for Hidden Objects Detection," Mat. Res. Innovat. (1997) 1:188-196. Jones, J.P, Lee, D, Bhardwaj, M., Vanderkam, V., and Achauer, B,, "Non-Contact Ultrasonic Imaging for the Evaluation of Burn-Depth and for Other Biomedical Applications," Acoust. Imaging, V. 23 (1997). Bhardwaj, M.C., "Non-Contact Ultrasonic Characterization of Ceramics and Composites," Proceedings Am.Cer.Soc., V 89 (1998). T. Carneim, D.J. Green & M.C. Bhardwaj, "Non-Contact Ultrasonic Characterization of Green Bodies," Cer. Bull., April 1999. Bhardwaj, M.C., "High Transduction Piezoelectric Transducers and Introduction of Non-Contact Analysis (NDTnet Vol 5 No 1)," submitted to the Encyclopedia of Smart Materials, ed. J.A. Harvey, John Wiley & Sons, New York, due in October 2000.